Your timber frame is the core of your building and a considerable investment as part of your build. You want to know that it will perform well, and keep performing for many years into the future. We only use industry-leading materials for airtightness and vapour control. And we don’t compromise. The materials we’ve chosen don’t just work well in themselves. We’ve tried and tested them over time to make sure that together they’re the best possible system for ensuring the airtightness and moisture control in your building. When you work with us, we’ll give you a detailed specification for the panels that will make up your frame, including the materials we’ll use. That way, you’ll know exactly which brands and products we’re using and can assure yourself independently of the quality of each component. High levels of airtightness are at the heart of energy-efficient and Passivhaus building. The Passivhaus standard of 0.6 air changes per hour is much more stringent than the 10 air changes required by current Building Regulations. Independent tests by specialist Paul Jennings, formerly of Aldas and now with Encraft, have shown the high degree of airtightness of our frames. 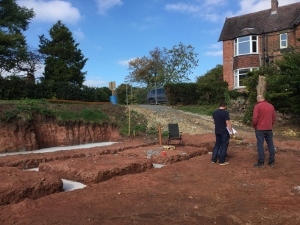 Our Passivhaus builds to date have comfortably achieved the Passivhaus standard for airtightness and our recent Passivhaus building achieved an airtightness reading that was the highest reading that specialist Paul Jennings had recorded in his 28 years’ experience. Airtightness doesn’t happen by accident. We achieve it through painstaking attention to detail – in how we produce our sealed panels and in the way we erect and seal them on site to construct your building’s frame. We have a small team of qualified craftsmen with many years’ experience of constructing energy-efficient homes, and we do it because we believe that all buildings should be made this way. We value quality over quantity – the quality of our work and the quality of our relationship with our clients. That’s why we work on just a few projects each year. What drives us is the environmental benefits of our method of building, and our dedication to producing buildings that we can be proud to say we were part of, buildings that serve well the people who will live in them or use them. We focus on projects where our clients share that ethos… whether you’re an organisation, a self-builder, an architect or a building contractor. Several of our buildings have been certified to Passivhaus standard, attesting to the high degree of airtightness and insulation you’ll achieve with our frames and the quality of our construction methods. Eden Insulation restored my faith in timber-frame construction. I knew their frame was in a completely different category as soon as I saw the panels arriving on the wagon. The materials they use are far superior and the panels were really well made. Putting it up went like a dream. We’ll be happy to put you in touch with previous clients for an informal chat about their energy-efficient buildings and their experience of working with us. It may even be possible to arrange for you to visit. Please contact us if this would be helpful for you. We’re members of UK professional associations for energy-efficient building. Eden Insulation have proficiency in Passivhaus detailing – from continuity of insulation and reducing cold bridges, through to minimising the frame factor and delivering a high level of airtightness. As a Passivhaus architect, working with Eden Insulation has reduced the stress on me because they are always ahead of the game.